For a decade, automakers and technology companies have been developing systems to eliminate 80% of all metal-to-metal mishaps. They’re the precursors to a driverless car future. So why doesn’t your car have them yet? Then SLAM! Out of nowhere, like a scene from an action movie, your car is T-boned by an SUV entering the intersection from the opposite cross street. The driver was talking on his mobile phone and ran the red light. Instead of skiing in deep powder for the next few days, you will spend the next few months in painful physical therapy learning how to walk again. According to the National Highway Transportation and Safety Administration, 32,367 people were killed in the estimated 5,338,000 police-reported motor vehicle traffic crashes–like the one imagined above–in 2011 alone (the most recent accounting). That means an average of 89 people died each day in motor vehicle crashes, one every 16 minutes. Another 2,217,000 people were injured in those accidents. Self-Driving Cars: Let Go Of The Wheel We reveal how automakers are sneaking features into their newest models that could earn them billions and save 30,000 lives a year–but only if they can convince you to give up control of your car. Our writer road tests the boldest autonomous innovations. Computers vs. Humans: It’s not about who’s the better driver. It’s about who we think is the better driver. Read about how Nvidia and QNX are tackling that challenge. 10 Autonomous Driving Companies To Watch: Hoping to snooze, work, or catch up on reading while your car takes you to work? Here are the familiar and foreign companies pushing us toward the ideal commute. It doesn’t have to be this way. For the last decade or so, the government and most automakers have been developing a system that could potentially reduce certain types of common accidents by up to 80%. Experts refer to it as vehicle-to-vehicle and vehicle-to-infrastructure technology, collectively known as V2X. It offers the potential for significant improvements in driver awareness including collision, hazardous road and curve speed warnings, and traffic flow information. It’s considered to be an essential component to the success of driverless cars. But the speed at which vehicle-to-vehicle or vehicle-to-infrastructure communications come into the mainstream is determined by the speed at which we accept the technologies–a true chicken-and-egg conundrum. “Being able to connect vehicle-to-vehicle and vehicle-to-infrastructure enables automakers to develop truly intelligent cars–vehicles with increasing levels of knowledge about the driver and driving conditions, from the road itself to buildings to the weather, says Paul Mascarenas, chief technical officer at Ford, a company entrenched in the development of V2V and V2I technologies, as well as the development of automated car tech. Ford recently announced the development of an automated research vehicle that was developed in collaboration with the University of Michigan and State Farm Insurance. “Combined with the cloud’s capability to process large amounts of data very quickly, the car is then able to use that information to provide drivers a level of assistance, convenience, and safety far beyond current expectations,” Mascarenas adds. Fully realized V2V would allow cars in the same area to constantly communicate with one another over a wireless network, exchanging data about each vehicle’s speed, location, and direction of travel. V2I allows cars to communicate with roadside infrastructure, such as traffic lights and cameras, etc. This type of roadside information network could relay information about road closures, detours, or construction zones, as well as warn a driver of, say, an upcoming school safety zone and encourage that driver to slow down. Before this technology arrives at a dealership near you, automakers have to agree on a standard for transmission and reception of this new communication system. Networking giant Cisco and the world’s largest tier 1 auto parts supplier Continental Automotive are collaborating on a network solution they call “bringing the Internet to the road.” It would allow the vehicle to communicate with the outside world via wireless networks. But for this to work, the networks would have to work flawlessly. The hiccups that interrupt your YouTube video could mean life or death on highways. Cisco and Continental have found the biggest challenge to involve receiving reliable signals in a fast-moving vehicle. Their solution would involve a communication gateway designed to seamlessly switch between 3G, LTE, Wi-Fi, and DSRC, providing several layers of backup and buffering to keep cars, devices, roads, and fixtures connected to the cloud with no dropouts. It’s an end-to-end architecture that delivers “enterprise grade network security and performance for all communications to and from the vehicle,” explains Andreas Mai, director of product management Smart Connected Vehicles for Cisco, which supplies the core networking capabilities and optimizes all communication links and mobility services to and from the vehicle. When used collectively, V2X paints a dynamic real-time picture of traffic and road conditions. 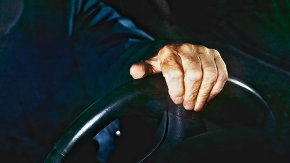 That picture can then be utilized by advanced driver assist systems, such as mitigated braking, lane keeping, and collision avoidance, to determine whether a crash is likely and warn drivers to brake, move over, or make some other kind of defensive maneuver to avoid a potentially lethal collision. In some case, the vehicle will use the information to automatically engage the brake or change lanes to keep the crash from happening. But V2X is considered essential to achieve the autonomous vehicle. The benefits of such a communications system are world-changing: fewer fatalities and less money spent putting the pieces back together. According to the Automobile Association of America, crashes cost $300 billion a year in the U.S.–three times more than traffic congestion. Every traffic injury averages $126,000. Finally, for this all to work, all vehicles on the road have to be equipped with autonomous technology and communicate with other vehicles and the roadside infrastructure. The external impulses from the surrounding traffic system would become more predictable and manageable. Human error–a guy running a red light because he’s yammering on his mobile phone, for example–would mostly disappear. No one truly knows when this will happen, even as some automakers claim they will have autonomous cars ready by 2020. The question remains: Will that vehicle be a truly autonomous, mass produced drone (the fantasy of every red blooded American), or take some other form, one that current technology will allow and humans will accept enough to take their hands off the wheel?